It is a strong and durable product that will filter out dirt and large suspended solids. The Pre-Filter cartridge prepares the water for the next stage of the filtration process, making sure that the system operates to its maximum performance. 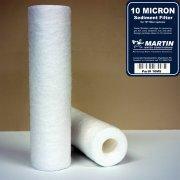 Replacement of the Pre-Filter cartridge is recommended every 12 months.